The International Symposium of “Chinese Design 40 Years – Experience and Model”, as an important part of the academic activities celebrating the centennial of CAFA, did not only review the development of design in China since the reform and opening-up, and designers, architects, design educational experts from home and abroad were also invited to share and discuss the cooperation and future developments in design and design education. 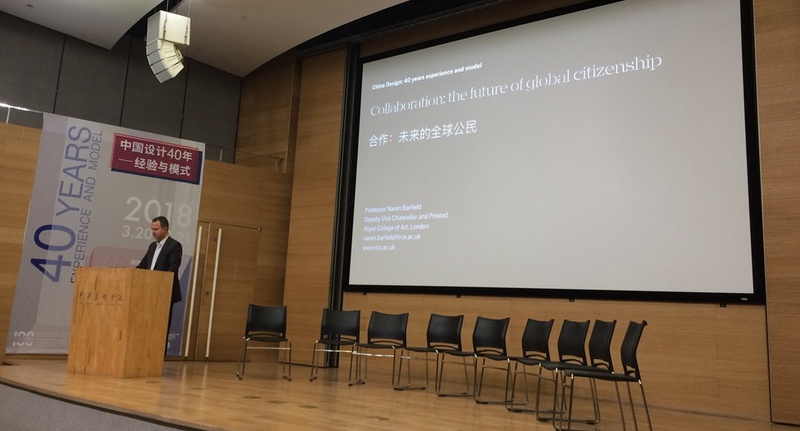 Naren Barfield, Deputy Vice Chancellor and Provost at Royal College of Art, was invited to deliver a speech themed on “Collaboration: the Future of Global Citizenship” at the symposium. CAFA ART INFO took this opportunity to interview him about his impression of development in Chinese design as well as his suggestions for young designers. CAFA ART INFO: Design, in the past 40 years, has made considerable progress in China. Would you like to talk about you initial experience or impression when you started to contact with Chinese design? Naren Barfield: That’s a very interesting question. I’ve been visiting China for 20 years. So that’s half of the period we are talking about. And I think I’ve seen huge developments. What I first saw was an infancy of learning, by repeating and copying with a very strong skill base. But less infancy in independent creative thinking. I think what I’ve seen very quickly has been in the last ten years, amazing development of innovation and ability to create new design solutions, apply design into technologies and other fields. A new type of student is much more critical, much more creative, and willing to challenge, and also perhaps more curious, internationally curious as well. I think quite a lot of changes happen in such a short time. CAFA ART INFO: Have you been involved in any design project or design education project in China? Naren Barfield: Yes, in fact, I first made contact with CAFA more than ten years ago, I used to work at different UK institutions which created the first U.K.-China joint programme in art and design. So we set up a joint undergraduate degree. And we have students studying at CAFA for part of the degree and U.K. for another part of the degree. And staff from the U.K. come to work in CAFA and staff from CAFA come to work in U.K. It’s really a great mode to start with. More recently, at the Royal College of Art, we have been setting up developing good connections with CAFA and a number of Chinese art academies. And we also have seen that the number of Chinese graduates who want to study at the Royal College of Art has increased, so there are much more connections, much stronger connections, and much more involvement in projects. We have seen lots of exchanges happening, in terms of design projects, within students and faculties as well. 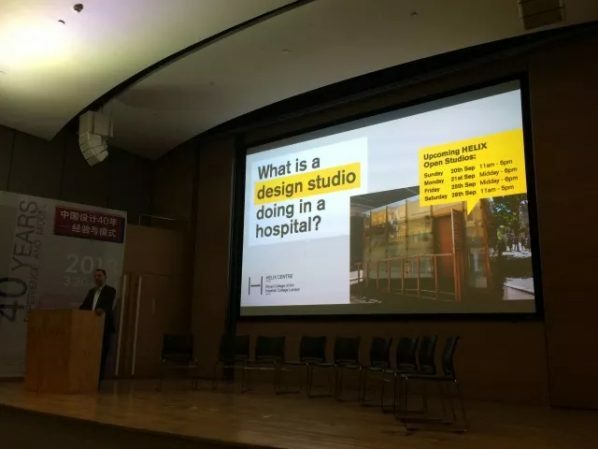 CAFA ART INFO: What do you think is the difference between the design systems of U.K. and China? Naren Barfield: Though I have visited China more than 50 times, I still feel I am a beginner. I have a lot to learn. I think the difference I’m seeing in China is because the country is so big, there are opportunities to do things on an incredible scale. And also when decisions are taken in China, I think things happen very quickly. It’s quite interesting to see. There’s a changing education system as I see it in China, we also have a very much changing system in the U.K. So I think these things are dynamic, and as we tried to connect between the two countries. We always have to keep an open mind. CAFA ART INFO: Have you visited the exhibition themed on Chinese design 40 Years? What do you think of the Chinese design that you have been involved in? Naren Barfield: I was very interested to see it and I was impressed by the quality of the design, quality of craft, but also the range, particularly some of the architectural projects across different parts of China, we were looking at vernacular design and local design, incorporating different communities, different styles, different local conditions, into a modernization of design and many other examples but very impressive. CAFA ART INFO: What do you think is the most important principle for design education? 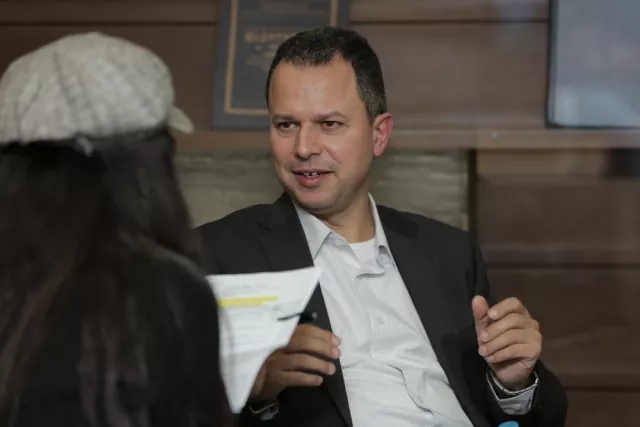 Naren Barfield: Maybe there are two, I think one is a value, value is to use design to try to improve life, so the world does not need a better or nicer or more expensive phone or coffee machine, we do not need it really. What we need is design that will help to improve life, where there’s a part of the world that doesn’t have clean water, or where there’s a need to help people be more mobile. So the value of improving lives. The second one I think for designers themselves and design students, is never to be satisfied and always to be curious and continue to challenge. CAFA ART INFO: What do you expect to achieve from cooperation between art colleges? What do you want to say to younger generation of students majoring in design? Naren Barfield: We are building partnership globally in Beijing, Singapore, Tokyo. We look forward so that we can learn, we are not simply located in London and waiting for students to come to London. More importantly, we also go out to the world, and we learn about other ways of doing things. For younger generation of students, I would like to say this will be your world. So you need to design the world and not design for the world, or other people. You will be leading the world. Your generation, and it’s very important the world is still changing rapidly and growing, there will be big challenges ahead on resources, on population, on energy and it’s important you use your talent as designers to help make the world better for its population and for everyone. You learn from the past but you do not need to imitate the past, you make the world new. Beijing Poly Art Center presents the solo show of Zhao Lu "The Laminated World"